…virtually any shape, making it much more versatile than traditional streamers. The Shamrock wire garland is 12 feet long and is made of a bendable wire. Everyone is Irish for a day on St Patrick's Day so dress up and decorate from head to toe with great Irish parties supplies for St. Patrick's Day. St Pats Shamrock Cutouts - 5"
…great shamrock package. 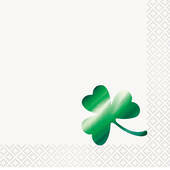 This set of shamrocks includes Ten 5", shamrocks all printed green on both sides. All the shamrocks you need at one low price. Everyone is Irish for a day on St Patrick's Day so dress up and decorate from head to toe with great Irish parties supplies for St. Patrick's Day. …work both in and outdoors and is a great attention getter. Each pennant flag says "Happy St. Patrick's Day" on it and the banner itself is 10 feet long. Everyone is Irish for a day on St Patrick's Day so dress up and decorate from head to toe with great Irish parties supplies for St. Patrick's Day. …this great shamrock package. This set of shamrocks includes five 5", three 9" and one 12" shamrock. Get all these great sized shamrocks at one low price. Everyone is Irish for a day on St Patrick's Day so dress up and decorate from head to toe with great Irish parties supplies for St. Patrick's Day. …shamrock tablecover is just right to fit most standard size rectangle tables. The shamrock table cloth is 54" wide and 108" long and made of plastic. Everyone is Irish for a day on St Patrick's Day so dress up and decorate from head to toe with great Irish parties supplies for St. Patrick's Day. …wear for the night whenever you go out. The Green plush shamrock ear muffs are made of a soft plush and have a great 4 leaf clover design over each ear. 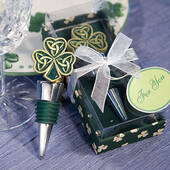 Everyone is Irish for a day on St Patrick's Day so dress up and decorate from head to toe with great Irish parties supplies for St. Patrick's Day. …and is appropriate for ages 18 and older. 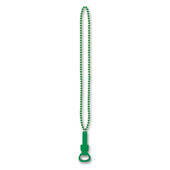 For a versatile costume piece that your family, friends, and coworkers will love, consider adding the Green Bottle Opener Bead Necklace to your party shopping list. Looking for more whimsical costume ideas? Get in touch with Party Supplies Delivered today. …for anyone over the age of 3. 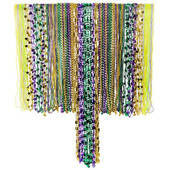 For a versatile costume piece that your family, friends, and coworkers will love, consider adding the 100 Piece Mardi Gras Bead Necklace Assortment to your party shopping list. Looking for more whimsical costume ideas? Get in touch with Party Supplies Delivered today.